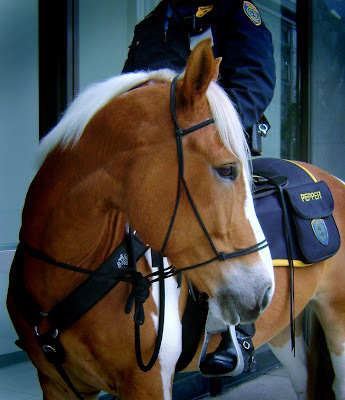 Houston Police Department: Meet HPD Mounted Patrol Horse "Pepper"
Meet HPD Mounted Patrol Horse "Pepper"
Although the Mounted Patrol Officer may be very intimidating in crowd control situations, the general public sees him/her as very approachable. Citizens who wish to see and touch the horse will stop the Mounted Patrol Officer many times in his/her tour of duty. Do you like horses? Pepper is one of the many horses that HPD has on the force. Once you put in at least two years of patrol time you may request to be transferred to the Mounted Patrol Division as openings become available. HPD is a large city with a large police department. Opportunities to move around within the department and gain multiple areas of experience exist only with a large department such as Houston. awesome, that is exactly what I want to do! ahhhh is the headless horseman! JK Pepper is a beautiful horse and I am considering looking into the mounted patrol when I am able to :) Another awesome job Officer McCoy! Cool pic Officer McCoy. I have applied to HPD. How does an officer get into the mounted patrol? You must patrol for at least two years before you can put in for a specialized division or unit.